I’ve written before about key performance indicators and how the dearth of data analytics and tracking software is spurring on a new era in sports performance analytics. The reality is, at least for the near future, the lion’s share of coaches and athletes will not have access to tools like SportVu and Noah Basketball shot tracking and basketball analytics. How does an average coach or athlete take advantage of what we now know to be true about shooting? For a moment, suspend your desire for sports tech. I’m going to offer up something that’s already freely available to us all. But before I offer up my hack, it’s important that you understand the why behind the what. In the early 2000s, I heard about a shooting coach by the name of Gary Boren. At the time, he was the free throw coach for the Dallas Mavericks. I was fascinated by some of the things I came across by him. When I was finally able to get my hands on his ‘basketball shooting’ book, I was hooked. What can I say, if he was good enough for the Mavs and Dirk, he was good enough for me. And, more compelling, this cat backed up all his claims by running the numbers; and, mathematically diagramming why adjusting the flight of the ball and what you aim at will give the ball the greatest chance to go into the hoop. Who am I to argue with physics?! To Boren, the ability to shoot straight is the most important skill to learn in shooting a basketball. To give the ball the best chance to go in, the ball needs the largest available internal ‘surface area’ (or entry space) inside of the hoop. Why Not Aim For The Middle? A lot of coaches teach that the middle of the basket is the target for shooters. And, if the ball was being dropped straight down, it would be. The mental leap that needs to be made is a shift in perspective – over to what the ball ‘sees’. 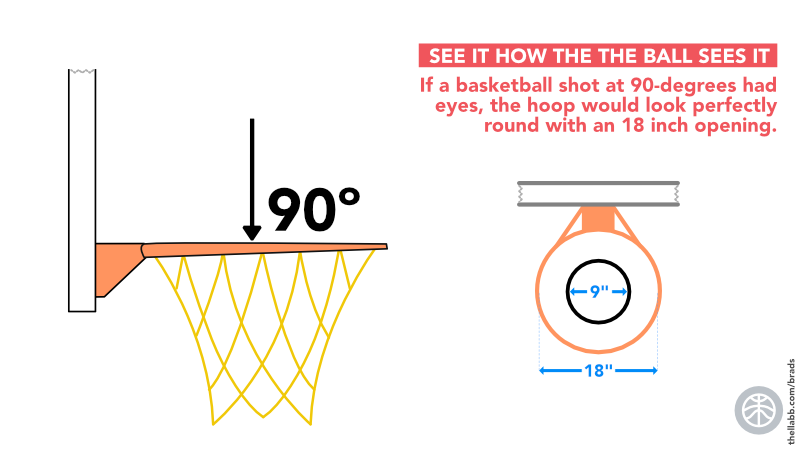 The opening of a basketball hoop is round. Fact… well, sort of. Why sort of? The ball doesn’t see the hoop the way we see the hoop. Every shot in basketball is coming in at an angle. Because the angle of entry is, well, at an angle, the ideal entry point or sweet spot, where the ball has the biggest area of entry (target), is displaced toward the back part of the hoop. 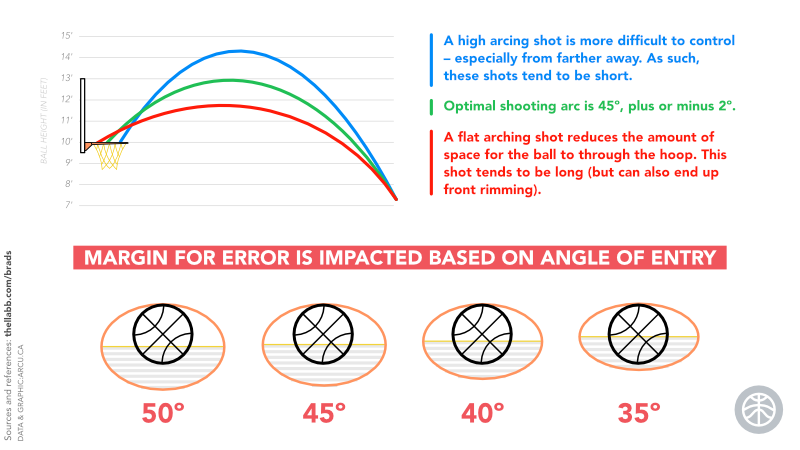 The science to the art of shooting is simply: the higher a shot’s arc, the wider the opening into the rim. Whew… that was a long way back to BRADs. Bless their hearts..! That’s a lot of shots to track. They published a paper about their research; which was presented at MIT’s 2017 Sloan Sports Analytics Conference. From all those tracked makes, Noah coined the term “BRAD shot” (i.e. back rim and down or “BRADs” for short). I love it! The concept is there’s to claim, but everyone’s to use. 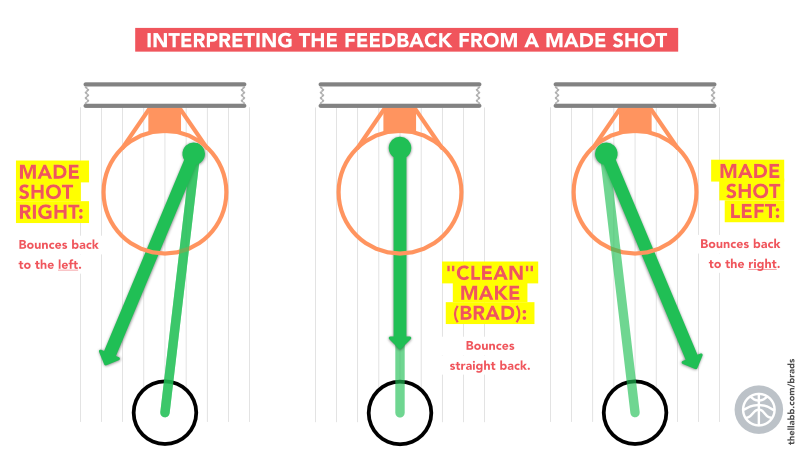 A perfect shot isn’t always really only a swish… it’s a BRADs. I now emphasize and orient the process of shooting the basketball toward BRADs. My approach is that I don’t want players to just take shots. I don’t want players to just make shots. I want them to make shots with precision and consistency . What does it mean to make it clean? Simple: BRADs. More specific than that, the goal is back rim and down—and have the ball bounce right back to you (as the shooter). That’s the crucial feedback. Here’s the hack… feedback is critical in order for players to improve their shooting. How a shooter makes a shot, is their real-time feedback on the quality of the make. I want athletes to have a Pavlovian response when seeing that ball trickle back to them. Like a bell has rung, they should be salivating at the feeling of seeing that ball come back to them. And, in turn, want to replicate that outcome every time. So Coach, please don’t rob them of that moment of joy by eagerly snatching the ball out of the air after it goes through the hoop. Let them see it take a bounce or two back to them. Reinforce the desired outcome by rewarding them with the feedback of seeing that ball come back to them. If the ball hits back rim and down AND trickles right back to them, they’ve made a clean (made) shot (i.e. largest guaranteed make zone). If it’s a BRADs that ricochets back and to the right, that means they made the shot LEFT. If it’s a BRADs that ricochets back and to the left, that means they made the shot to the… RIGHT. In all the above scenarios, a shot was made. Yet, only in the first scenario did they make a clean BRADs. In our training, it’s no longer just about ‘did you make it?’. It’s ‘how did you make it?’. This approach amps up concentration. Heightens engagement. Raises the rigor. Engenders a pridefulness in players. And, gives immediate and obvious feedback on the consistency of their shooting. Ultimately, that last point is the most important one to me: consistency. The best shooters are the most consistent shooters. 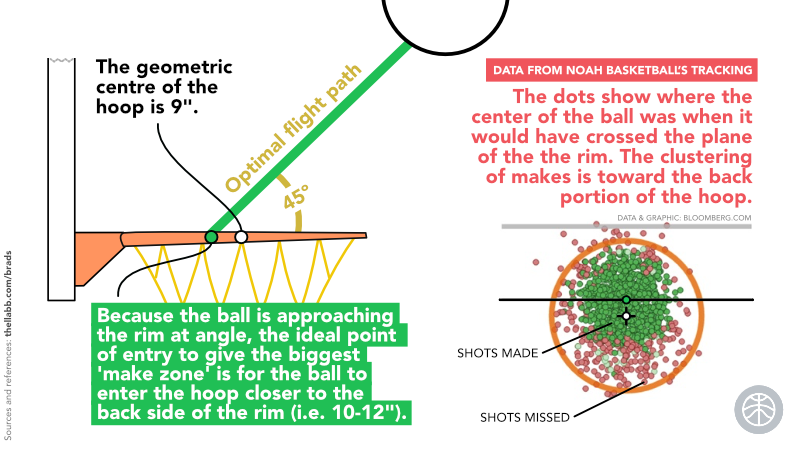 So now, it’s not just about short or long, it’s about where/how the ball enters the rim. Here’s the thing about BRADs… Once you see them, you can’t unsee them. Clutch Kristi sinks the clincher! You’ll notice that good shooters already do it. See for yourself… Here are all Steph Curry made threes in 2016-17 . 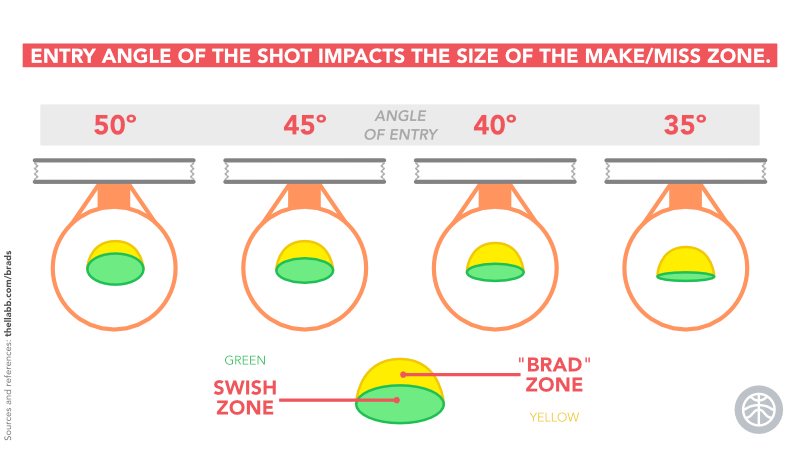 Great shooters make BRADs consistently—and consecutively . Listen, no matter how convinced you are that your way of teaching shooting is the best way to teach shooting, the fact is, there are many different ways to arrive at the same solution—technically. Whichever way you teach shooting, we can all now challenge the myths around what part of the rim to aim at. Thanks to Boren and sports tech, we know better. Facts are facts. Or, said differently, in an age of alternate facts, physics is physics. This is no longer an issue of personal preference. Or, just as pervasive, we must fight the mentality that succumbs to “it’s always been done that way” or “my way”. Young or old. Novice or experienced, introduce your players to my our little friend: BRADs. No need to keep him to ourselves. He doesn’t discriminate. He’s available to all that work at it. No equipment required. And, best of all, once introduced to an athlete, BRADs belong to them too. They can self-monitor and will no longer look at making shots the same way. Let’s raise our standards for shooting—ours and for our players. My guy Dave Hopla has a great sign off: “Best Swishes!” Always loved that. Guess I’ll have to stick with: “Say hello to my little friend!” [Said with an Al Pacino Scarface voice!] until I get something better. PS: I know there are some of you wondering about the arc of the shot. If I had a Noah Basketball system, I’d sure hook it up and leverage the technology. I don’t. Most don’t either. You remember what Coach Boren said? Find a way to change a player’s shot on all things that are mandatory. Priority one for me is shooting the ball straight. And then, on target (BRADs)—consistently and consecutively. Intermingled into that, if I feel that the flatness of their shot is pronounced, I’ll cue them (‘Ceiling!’).